The Sierra Madre Tattler! : Cough Up Resident, Your Sanitation District Wants More of Your Money - Plus: Is Sierra Madre Stupidly Claiming It Has 181 New Development Sites? Cough Up Resident, Your Sanitation District Wants More of Your Money - Plus: Is Sierra Madre Stupidly Claiming It Has 181 New Development Sites? Don't know if you ever got this piece of mail. As a matter of fact, I am not even sure I received it. I don't recall such a thing ever happening. The notice to the left was forwarded to me by a neighbor over the weekend. Apparently a rate increase for treating sewage (or turning it into "resources" if these guys are to be believed) is now going through a process of some sort. Just like the sewage does, I guess. And in order to stop this rate hike it would take 51% of the beneficiaries of this earthy service to get their Prop 218 protest votes in by, well, tomorrow. Did you send yours in yet? Because if you haven't, I regret to inform you that the opportunity for doing so has nearly passed you by. I scoured the Internet for clues about this momentous event, looking in particular for news about how much this rate increase for sewage treatment will be setting we the people back. Sadly, there was only one article on the topic to be found, and it was published in the Whittier Daily News. Probably because that is the city where this so-called Public Hearing will be held early tomorrow afternoon. You can only imagine the ravening hordes that will be beating down the doors to get into this one. Here is the gist of it all (link). Sanitation Districts of Los Angeles County propose sewer rate increase - The Sanitation Districts of Los Angeles County has proposed raising its sewer fees over the next three years, ranging from 3 to 6 percent, or $9 to $15 annually, depending on where you live. Public hearings about the proposal will be held by each of the districts’ boards in May. Dave Bruns, assistant department head for financial management, said the rate increases would be imposed in much of Los Angeles County and raise about $9 million. The additional money is needed to pay for routine maintenance of sewers and treatment plants, ensure that reclaimed waste water meets state standards and build a third discharge tunnel from Carson to Palos Verdes, Bruns said. I have grown to dislike the Prop 218 protest process. A ballot vote by the people is far preferable in my opinion. Prop 218 assumes that there will be close to 100% participation by the afflicted rate payers, whereas a direct vote on a ballot initiative would only take 51% of those who actually bother to vote. An election based on an item like this odoriferous sewage rate hike would likely turn out only around 10% of those eligible to vote. I doubt our recent water rate increase would have passed had it been put on the ballot for a public vote. And had City Hall been permitted to put Measure UUT up for a Prop 218 protest last April it probably would have survived. Not that people wanted it, mind you. The results show that a majority of those who cared enough to turn out and vote didn't want it. It seems that anything put through the Prop 218 ringer just doesn't register with most folks. And for the opposing ratepayers to prevail 51% of everyone afflicted would have to vote their disagreement. This in a city where a 35% voter turnout is considered something to boot scoot over. Prop 218 votes also get far less media coverage than anything put to a ballot vote. Such as in the case described above. One article in a newspaper that doesn't get distributed in Sierra Madre just isn't going to get that done here. c) AUTHORIZATION TO PURCHASE WATER CREDITS FROM SAN GABRIEL VALLEY WATER DISTRICT, EQUALING $361,500 ($1,023,421 total spend for meeting). We discussed Item #4 a little bit yesterday. Something that, in my opinion, might very well be a stealth move designed to help push development at Mater Dolorosa and other similarly afflicted settings in town. You know how City Hall likes to keep its processes oblique when plugging for things the people they supposedly work for do not actually want. Plus our lawyerly Mayor seems to have quite a flair for deliberately opaque language. We'll be seeing a lot of that sort of thing over the next year I suspect. But here is a bigger question. If we can list 181 places where new development can occur (click here), and that includes 60 densely packed McMansions at Mater Dolorosa, how can we ever tell SCAG that we are built out? How are we going to convince those clowns to keep our RHNA numbers down? Sign off on numbers as stupid as those and the state will demand huge new development in Sierra Madre quicker than you can say BIA (Hearts) CAR. And couldn't that 60 McMansion number become a self-fulfilling prophecy when the lawyers for New Urban West come sniffing around? There is also this. How can we tell any government agency that Sierra Madre has a water problem when we have voluntarily identified 181 sites for potential development? What becomes of any building moratorium then? I believe it was John Capoccia who called for these higher numbers. You know, the guy who ran for office as a mighty tax fighter and slow growth die hard. What in God's name happened to John? Did the Pod People get him? Last week potential developers of the Mater Dolorosa site were privileged with a private meeting that included certain senior members of City Staff. Apparently there will now be another similar secret meeting this Thursday. Ever feel like you're being left out of all the fun? Secret meetings with Catholic Priests I can do without. Some go to therapy for years to recover from those secret meetings. Who at City Hall arranged for these secret meetings between the developer and the City Council and Planning Commission. When will people wake up that City Hall is trying to destroy our town so that they can pad their resume with developmet projects and increase revenue for their own salaries and benefits. That's what all this is about. We are payng them to do this. Don't you think something is wrong here. It is a business deal. City employees get to fund their perks, and the developer gets to sell million dollar McMansions. The people living here? A PR problem. They've hired people to handle that. If they are a politician and their talking then they are lying. If they are a lawyer and they are talking they are most likely lying. If they are a lawyer and politician and they are talking they are most definitely lying. That's what Sierra Madre is up against in our effort to preserving our little village, lairs and development people. This latest group of developers don't live in this town. They only want to maximize their profit and move on to the next project. We are all left with the consequences. Could you name me some developers that do live in town. Somebody needs anger management training. Wow!...great come back..you're so clever..
5:50 - that juvenile carping again. Do you think s/he is being paid to sully the conversation? Or is it a hobby? It could be a cry for help. All we can do is show up tonight. PLEASE show up if you care about our little town. What is City Hall and City Council to think when there are only six people in the audience and three or four speak - the same people who always speak and are articulate and reasonable, but they can't do it on their own. Unfortunately, people can't and/or won't make all the meetings - so you have to be selective about when you ask them to show up. Right now the developer for Mater Dolorsa is gauging the amount of opposition before they spend any money. In their secret meetings with the City Council and Planning Commission, the purpose is not to "introduce themselves". The purpose is to see how receptive our representatives are to the zoning change and their overall project. If these members suggest they'll have an "open mind", the project goes forward. LIkewise, when they go door to door to the neighbors, they will again test the waters. If the neighbors roll over or project ambivalence, the project moves forward. Representatives form Mater Dolorosa and the Developer will be very nice and charming but the first question to ask them is whether or not they live in Sierra Madre. Their only purpose is to get that huge housing project crammed into that open space. Then they move to the next project and leave the consequences of over-development and McMansions for the residents of Sierra Madre to deal with. A lot of wisdom in what you are saying here. Thanks for posting. Another ploy to watch for: 60 houses - no we would never want to build 60 in that environmentally sensitive area. How about 40? 60 may be a negotiating ploy. Developers always ask for more than they expect to get so that they can say they compromised to get to the real number they had in mind in the first place which may be 40. This is a game to them and they will be very good at it. Anyone sorry they voted for John Cappocia? Just like with Mosca I should have voted for the Eagle. The pod people didn't get to John Capoccia, the City Manager did - I suspect. As smart as John is, he seems to fall for so-called authority. He needs to get back to his base and question Elaine and her side kick city attorney. Both of them seem to speak without knowledge at some point. Elaine makes things up if she doesn't know the answer, and as we've seen, so does our City Attorney. John spends hours with her. Why isn't she working instead of chatting with him. I suppose chatting with him is her job. It ensures that he will vote her way. I think very highly of Capoccia, but agree that the city manager has snookered him. He seems to buy the "poor overworked victimized staff" lie. Maybe he has never worked someplace where the staff was so immersed in a culture of laziness. I have, and can spot it a mile off. Capoccia has become a disaster. He is to Sierra Madre politics what Charlie Christ is to Florida politics. I think if Rachelle and Denise lean on Capoccia, he'll fall in line. It is going to be girls against boys. I'm sorry I voted for Capoccia, too. John, please use your intelligence and not get "snookered" by Elaine! So staff found an additional 75 development sites, after the volunteers who worked on the General Plan came up with 106. 70% more than the committee made up of residents had. Tells us a lot about staff. Imagine what the numbers would have been if it was entirely up to staff! We'd be looking at a new downtown renamed "Pension Plaza." Oh, and a new Sierra Madre convention center called "Healthplan Hall." 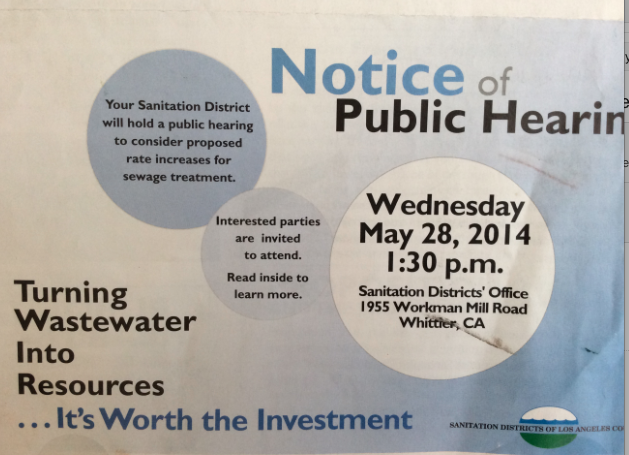 How come the sanitation district is holding a public hearing on a cost increase at 1:30 in the afternoon on a workday? 10:24 - Because we allow them to do it. We received the notice some time ago in our mail. It looked like an advertisement instead of something serious, like taking tax payer money. I also did not see it. I think the government loves the Prop 218 process. Sure they do. otherwise they'd have to put al;l their money grabs on the ballot where the people who actually vote can sink them. Like with Measure UUT. I received mine in early April. It looks like an advertisement. I imagine most folks thought it was junk mail and tossed it into the trash. I suppose that is what they are hoping for. I am disgusted with the whole 218 process. It always favors the government! But with Coluntuno's fingerprints on the formation of the process, what do you expect? I agree. It is rigged. Government has become a confidence operation. Sounds like at one time we had a public works director who knew what he was doing. Long before that fraud Inman. Bevington. Wasn't he the moving force behind the founding of BevMo? The professor had a small change to the minutes - but he doesn't know what it was? How many of the council members have to thank the same people? So we're going to get a civics lesson about how voting works. The mayor has asked the same question about consolidating elections - internally. Perhaps the lady was a plant. Pushing Sierra Madre elections into bigger elections would dilute the activist slow growth vote. It would also dilute the anti-tax voter block. Ben Wong, the Edison man has emerged from the crowd. He will speak to us for a long while. Ben wanted to explain the importance of redundancy to us. Yes, "look into it" city manager!!! It's a way to save money. If it'll save us money, this city manager is neither motivated nor interested. Open session for the developers - yes. The gentleman is speaking at an odd time (not the open public comment, but comment on the consent calendar) but everything he's saying is very true. Secret meetings are taking place between the Mater Dolorosa developer, New Urban West, and all the petty dictators at City Hall. The public has obviously been squeezed out. Harabedian's response was to note that the comment was not given at the proper time. Great question from the audience. What prevents any room from being turned into a bedroom. The city's very ineffective code enforcement - which is why the Director just blew it off with a shrug. Oh boy, it's the UUT oversight comm. up next! The rubber stamp group. City hall's puppet show. There is no ability to track the money. The City couldn't get rid of it because it was put into place by voters who were told the committee would matter. It didn't. The build out numbers are not for protection. What a farce. Oh but it's to preserve the environment! Honest. 98 new units sure sounds a lot better than 181. The EIR consultant can't go forward withpout numbers - so here's a number. Zero. We are built out. Excellent Arizmendi! Why is that monastery housing number of 60 there when the zoning does not allow it? Yes Caouncilmember Capoccia! The council needs to agree what land use will be before numbers! Why are so many new units being added without the procedure that was in place for the GPUSC. Delmar hits it out of the park. Castro is not answering her questions. Staff is deciding our build out number, not the residents. Director Castro does not understand. Director Castro DOES understand, that's why he has to act like an idiot, just like he did before the Planning Commission. He was supposed to explain why the maps were consolidated, kept saying, "I'll get back to you," even though he spent FOUR YEARS sitting in on the GPUSC meetings. Really, Danny? I wonder if any of the volunteers included real estate agents. No. Their notes are in the staff report. Old time residents. Delmar, just wants to be sure that it is clear "we are in no way sanctioning the 60 houses." Am I hearing correctly? It looks like Goss, Capoccia, Delmar and Arizmendi are holding the line against the overdevelopment push. Thank you MacGillivrey! The EIR does not drive the general plan. Her clarity and intelligence are just always so welcome. Moderator - get MacGillivrey's speech for the blog? Another speaker "Remember your promise." Who is this guy lecturing the audience? He wandered in from the Buc. Why isn't everybody invited to the secret meetings? Best question of the night. Aww, everyone knows that the City Staff was just showing New Urban West some hospitality. The New Urban West meeting was written about in the City Manager's report. Did you get an invitation? Did it take place in Council Chambers? The whole thing will be postponed - but I don't know what that means, really, down the road. It means the fight is rescheduled. How the numbers will be used later is a big concern, and thanks Arizmendi for saying that. I'm glad that Capoccia sees now what SCAG would do with the numbers. Looks like it's another good night for Sierra Madre residents. Goss repeats Capoccia, thanks him for ideas, says he agrees with him - because he doesn't hear Delmar or Arizmendi. Goss has no original thoughts of his own. Good. Omments from the audience. let's not let the Feds take over our land. Agreed, NO FEDS....no stinkin' badges in the treasure of Sierra Madre! So who paid this guy to come into Sierra Madre? Does he live here? Send him back to Judy Chu's office. Great another paid bureaucrat, Faustino, who lives in ROSEMEAD comes to support the bill. Go Home !!!!!! what a liar. f you went to any of the public forums they were just dog and pony shows and oly addresses Judy Chu's side of the argument. And, hey did Faustiono listen to the residents comment on the general plan? Go Home!!!! hey, Faustino, your three minutes were up two minutes ago. sorry Caroline, can't support you on this. keep the Feds out of Sierra Madre. national Forest area has fewer restrictions than national park area. keep it national forest. what M. Schuster neglects to mention is that the restriction and changes in rivers etc. all happened due to the federal government intervention. P.S. Send these paid commentators home!!!!! question: why does gene goss call himself a registered republican? To prove the meaninglessness of being registered with a major party. Ahem, Rachele, All FEDERAL Dollars are really dollars from your pocket and mine. The government has no money except that which it takes from us. Looks like another one of Nancy Walsh's independent votes has gone down in flames. Glendora, California doesn't care that the rest of the state of California has a water problem nor the rest of the country for that matter. The city has allowed 9,360,000 per year to wash down it's gutters and into concrete flood control channels. City council members, city manager, city department heads and city attorney all do not care one eye oat ta, being that they are 1% and the cost of the water means nothing to them at all, besides they have purchased more water from resources outside the city limits. Even a board member of Three Valley Water doesn't care either, Ex-city council member and Mayor Bob Kuhn - he just laughs the issue away. Of course Bob Kuhn was removed from elected office after he incurred a fine of $2.0 million dollars against the city, the tax payers had to pay for his illegal actions. So while other cities worry Glendora officials allow water waster to escape Scott free and punish little old ladies and men who are living on fixed incomes.